The Pontifical Scots College in Rome was founded on 5th December 1600 by Pope Clement VIII. It provided an education for young Scottish Catholic men who, due to the laws against Catholics, could not receive a Catholic education at home. Inspired by St John Ogilvie, the sixteen students studying at the College vowed in 1616 to return to Scotland as priests, one year after the Saint’s martyrdom in Glasgow. During the centuries that followed, the college sent a steady supply of priests to Scotland, being closed only when the French invaded Rome in 1798 and again during the Second World War. For two hundred years Jesuits and Italian secular clergy directed the College, but since 1800 the Rectors have all been from within the ranks of the secular clergy in Scotland. 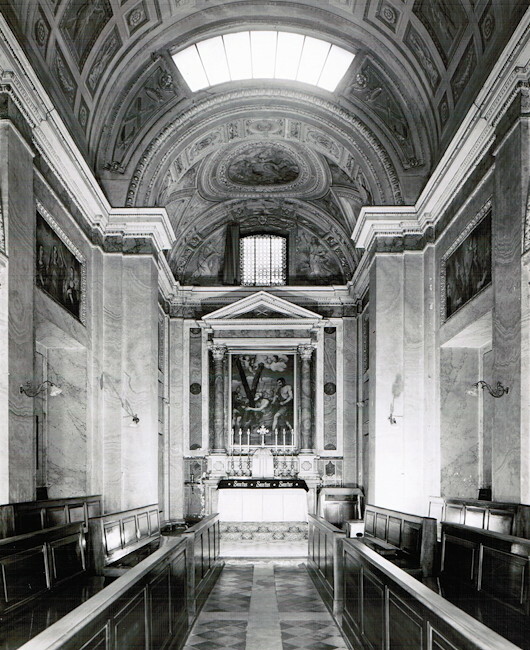 The interior of the college chapel on Via delle Quattro Fontane. At first the college was sited in a little house on what is known today as Via del Tritone, opposite the church of Santa Maria in Costantinopoli. In 1604 it was transferred to Via Felice, now called Via delle Quattro Fontane, and there it remained until 1962. During its time on the site opposite Palazzo Barberini the college went through several phases of building. The first united the mixture of houses into one combined building behind the facade that remains today. In the early part of the 20th century the college was extended with a wing looking on to Via Rasella. A national church for Scotland was built in 1642. The church of St. Andrew of the Scots was built beside the college. Although the church still stands, it has since been deconsecrated. The present college building on the Via Cassia was opened in 1964.